Courtesy Photo Amanda Bush poses with her father Anthony Bush, Ohio Corn Grower’s Association Board member (left), and Brad Moffit, Ohio Corn Growers’ Association Market Development and Membership Director. 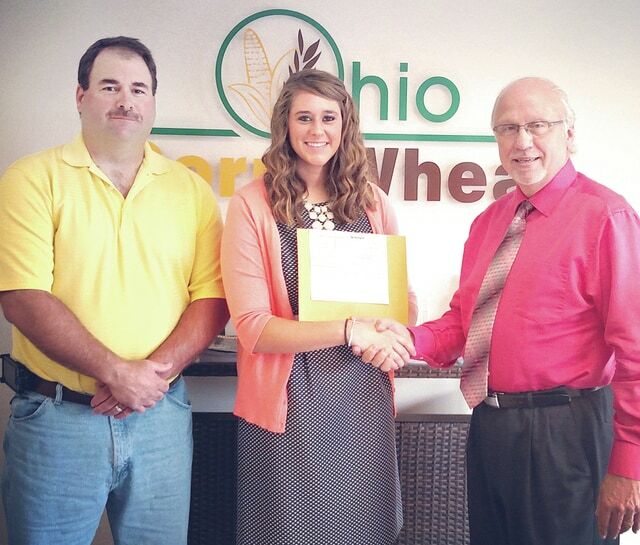 DELAWARE, Ohio-The Ohio Corn & Wheat Growers Association (OCWGA) is pleased to announce that Amanda Bush has won the organization/s scholarship for membership recruitment. Amanda is a student at The Ohio State University’s Agriculture Technical Institute and will be attending OSU/s Columbus Campus this fall. She will pursue a career path through the College of Food Agricultural and Environmental Sciences at OSU. She is a graduate of Mt. Gilead High School. OCWGA launched a student membership this past year targeting high school and college students who plan to enter farming and agricultural careers. This scholarship award was created to recognize collegiate leaders who actively market membership to these two groups of future agriculturists. Amanda/s efforts helped the organization experience a year of positive membership growth. The Ohio Corn and Wheat Growers Association represents the public-policy interests of tens of thousands of grain farmers throughout the Buckeye State. As a united entity, OCWGA has positioned itself as both an educational and political powerhouse for the regulation and advancement of domestic and international issues that affect the success of Ohio’s corn and wheat markets.